Jane regains consciousness on the shore of a strange island. On the rock, which stands in the middle of the sea near the island, shines the Lighthouse. Mike, her husband, is not near, though she vaguely remembers that the wreck of the sea they were washed up together from this ship. Searching for Mike, Jane gradually understands that this island is a huge graveyard of ships. Gradually getting to know the island's history and the tragic story of a lighthouse keeper, Jane realizes what danger threatens her and Mike, if she couldn't save him. 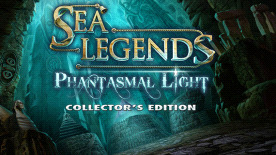 Play colorful Hidden Object, solve puzzles, unravel the dark secrets of the island and secrets of the deathless lighthouse keeper. Can you outwit the ancient heritage and escape with Mike from the island?